Finding a safe and/or convenient place for your kids to play isn’t always easy. A swing set in your backyard is not only convenient; it’s also an effective way to provide the neighborhood kids a safe place to play. Before purchasing a swing set, no matter how large or small, check that you have the proper space, the set is age appropriate and you have the correct tools and assistance to assemble the unit. Or simply let us at Amish Woodwork help you choose the appropriate swing set and install it for you. That way you can be assured that it is installed correctly. Since our swing sets are built to last a lifetime, we will be sure to install it with that in mind. When we look for a location to install a swing set, there are some specific things we look for. First we need a flat surface that is preferably at least 10 feet away from your home, fences, a septic tank, patio, hot tub or any other permanent structure. The area also needs to be away from electrical lines. You may have some specific ideas too. Do you want to be able to watch the kids from the kitchen window or other specific point in the house? Landscaping and lawn maintenance will also be a concern. Many times the family dog’s patch of grass that it uses as its “bathroom” may be an issue too. These are things we will discuss before installing your new swing set. The choice of swing set will also determine where it can go too. Slides, playhouses and other options will have an impact on the size of the set and therefore the placement in your backyard. Having an idea of how much space you have when you come in to Amish Woodwork will be helpful in deciding which set will be appropriate for your yard and your family. You should create a budget for your swing set. A good quality swing set is an investment for your family and neighborhood. You should decide what you want to pay and also if rent-to-own financing would allow you to get the perfect swing set at a monthly price you can afford. We have a 24-month contract that can bring a little nicer swing set into an affordable monthly payment for you. We are currently offering swing sets from both Swing Kingdom and Play Mor . Both of these supplier provide excellent quality and safe Amish Built swing sets. Swing Kingdom has vinyl swing sets and outdoor playsets for backyards and families of all sizes. 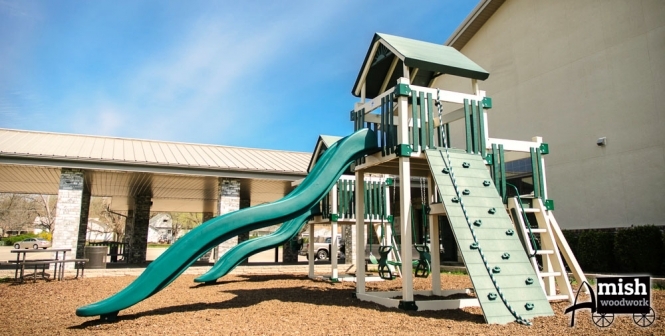 Our vinyl swing sets and playground equipment are built to last, compliment your yard and are low maintenance as well. Feel free to check out their website and design your set before ordering with us at Amish Woodwork. There are many options available from modest sets to grand “kingdoms” to bolster your child’s imagination and playtime. Play Mor provides wooden swing sets and play sets for backyards and families of all sizes. These swing sets are crafted from No 1 grade treated yellow pine thus allowing years of service. All the edges and been rounded and surfaces milled keeping the swing set free of sharp corners and rough surfaces. There are tons more benefits built into these play sets and feel free to check out their website. Find something you like contact us here at Amish Woodwork and we will be happy to set you up with these swing sets. The percentage of children aged 6–11 years in the United States who were obese increased from 7% in 1980 to nearly 18% in 2010. Similarly, the percentage of adolescents aged 12–19 years who were obese increased from 5% to 18% over the same period. There’s no end to the benefits of your child getting exercise, using his or her imagination and socializing with the neighborhood kids on their outdoor play set. Just think, your new swing set can help your children’s physical health as well as their mental well being and self esteem! We have lots of satisfied customer and you can see some of them on our Facebook page too.